Despite the rising costs of higher education, a college degree remains the single best way for young Americans to find fulfilling careers. College graduates are likely to earn more money, live healthier and happier lives, and contribute more to civic life than their peers whose education ends with high school. These barriers raise large, national questions, and they won’t be answered overnight. But if you’re passionate about education, there’s good news: you can volunteer, right now, to help students overcome each of them. Even for academically successful students, the college enrollment process can be confusing — and without strong guidance, they can end up going to a less-than-ideal school, or not enrolling at all. A report on students from Chicago Public Schools found that nearly all students who aspired to college and completed applications were accepted, but “[o]nly 41 percent of students who aspired to receive four-year degrees even completed the steps [during] senior year needed to apply and enroll.” Students who didn’t come from a “strong college-going climate” were also likely to underrate their chances, and to apply for less selective schools than they could have. As a volunteer, you can help contribute to that climate. Most advice about college selection and enrollment comes from students’ family members and high school guidance offices; reach out to your local schools and parent-teacher organizations to find out ways to contribute. And if you’re working with high school kids on academics, take some time to show them a few college comparison tools (or do virtual tours of their dream schools!). Financial support of scholarships is the best way you can help address the completion gap, but volunteering also pays off. The Free Application for Federal Student Aid (FAFSA) is crucial but often confusing; the College Goal Sunday program is a great way to help. At College Goal Sunday events around the nation, volunteers come together to answer students’ questions and help them complete the FAFSA. Whether you’re a finance professional, an educator or even a parent who’s filled out a FAFSA yourself, consider hosting or volunteering for an event in your community. 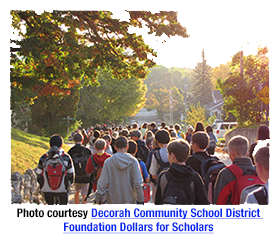 You can also help out as part of a local Dollars for Scholars affiliate. Scholarship America’s network of volunteers raises funds and awards scholarships to students in thousands of communities across the nation, and many affiliates also help students navigate and understand the whole financial aid process. If you want to volunteer on behalf of students, but you’re not sure where to start, you can find or create an affiliate near you. And no matter how you choose to help, your volunteering might just be the crucial bridge between high school diplomas and college degrees in your community.